This 36-foot long bar countertop was created without seams and to appear extra thick. Global Surface Solutions in Kelowna, British Columbia. Countertops made of concrete really have no limitations in size, depending on the materials and casting techniques used. Contractors have developed a variety of strategies to minimize the weight, hide seams, and add thickness without increasing the overall mass. “The only restrictions to dimension are access to the room where the counter is being placed and the number of people who can help lift it,” says Sean Jaegli of Global Surface Solutions, a concrete design and fabrication studio in Kelowna, British Columbia. ThicknessThe standard concrete countertop slab thickness is 1 ½ to 2 inches, similar to countertops made of marble or granite. However, contractors can create the illusion of a thicker countertop by casting a drop-front edge. On this kitchen island, for example, the top is 1 ½ inches thick overall, but appears to be much thicker because it was cast with a 6-inch drop-front apron. WeightA 1 ½ inch thick countertop made of standard concrete has an approximate weight of 18.75 pounds per square foot. (Granite is approximately 18 pounds per square foot.) Standard cabinetry will typically support this weight because it’s distributed over a large area. For larger countertops, however, where weight can be a problem in terms of both handling and installation, contractors can use glass-fiber-reinforced concrete, lightweight cores, or special reinforcement methods to keep the weight down. With GFRC, the slabs can be cast in thinner sections than similar pieces made with traditional concrete, reducing the weight by as much as 75% while still maintaining tensile strength. “Depending on the application, we will employ different systems to reduce countertop weight. We incorporate lightweight cores and then use layers of metal/fiberglass mesh and specialty concretes,” says Jaegli. 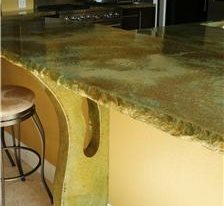 SizeConcrete countertops can be cast in nearly any size or shape. Depending on the overall dimensions, joints or seams are often incorporated to accommodate handling. These seams can often be concealed with color-matched grout or a veined finish, or they can even be used as an attractive design element (see this massive concrete dining table made of three slab sections joined by decorative stainless steel bands). Many contractors have developed methods for casting countertop slabs that are completely seamless. “Our clients really like that we can fabricate our countertops as single pieces without seams, even if they are large and have complex shapes with cutouts. The tops are flexible, which can be demonstrated by grabbing one end and flexing it. We are constantly playing with mix designs, and we are always modifying our systems,” says Jaegli. See these other tricks for making super-sized countertops. Oversized Countertop ExamplesClick through to see more images and read about how each of these projects were created. Seamless White IslandHard Topix Precast Concrete, Jenison, Mich. Concrete Countertop Makes a StatementHard Topix Precast Concrete, Jenison, Mich.